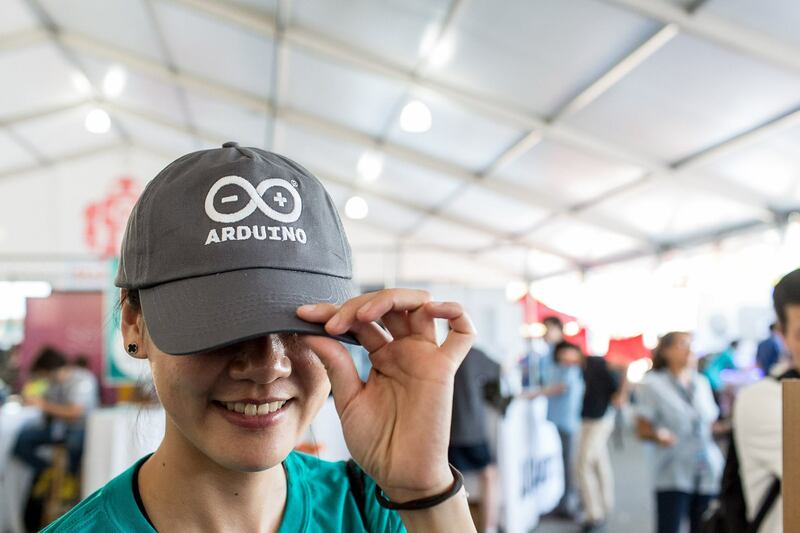 This entry was posted on November 30, 2017 by Arduino Team. Maker education is something very close to my heart. It is a gateway to STE(A)M fields and a great way to learn creative problem solving. 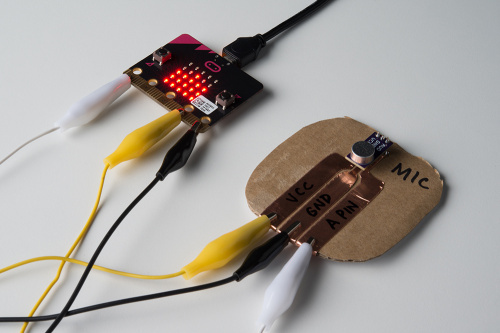 Two of the traditional challenges — barriers to entry — of bringing electronics into maker education are cost and accessibility. This week I have been experimenting with different ways to drastically reduce cost and increase accessibility with custom circuit stickers and cardboard circuits that don’t remove the circuit design in the process of exploration and play. 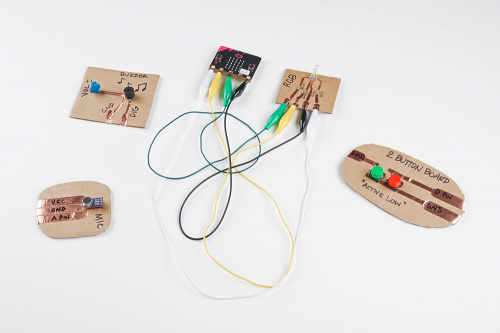 The idea for cardboard circuits came from DIY Electronic Modules for Tinkerers on Microsoft’s GitHub. And the stickers came from the cost constraint of something like $0.25/circuit. It’s hard to see, but the top strip of tape has traces and tabs cut out, the second row has outlines of bats, and the third has outlines of unicorns. The second and third rows of tape are for a cap-touch project. 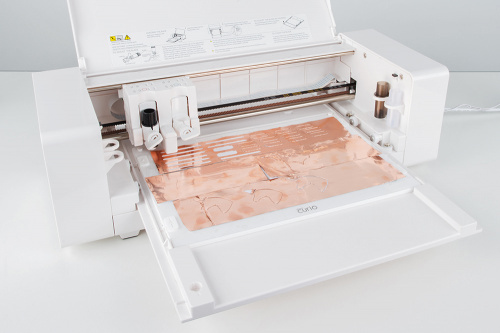 I’m using the Silhouette Curio, a programmable vinyl and paper cutter, to cut through copper tape. It isn’t a trivial piece of equipment, and it is costly at $120 (on sale at Michaels). I still haven’t wrapped my head around the software either, which is why the current stickers don’t look so nice (but they work!). The end-game is to hammer out the 10 or so essential beginner circuits and get those designs to a die-cutting sticker manufacturer. At first, I was soldering the parts to the copper tape. Without soldering, a tiny dab of jewelry glue and then Bare Conductive paint dabbed over the connection worked great. I’m now experimenting with mixing different glues in with the conductive paint and characterizing the results. With these six themes, I created the modules. I’ve organized the pile by type: rounds are inputs, and rectangles are outputs. For the inputs I made an Electret Mic BOB module, a two-button board module, a photocell module, a switch module and a tilt sensor module. For the outputs I made a buzzer module, an RGB LED module, a servo module and a larger speaker module. I also have this weird thing — the bigger something is, the easier it is for me to understand it. Troubleshooting a problem on a breadboard usually means ripping up and starting over. With everything connected through alligator clips and visible/large/labeled traces it is much easier. As I continue to develop around this idea, I want to incorporate ways to up the difficulty. Currently these are single layer, but with the addition of paper or more cardboard and possibly the use of coiled paper clips to use as vias, the concept of multilayered PCB design can be explored. I’m also looking into creating a “library” of through-hole and SMD parts for the Curio machine. I want to get an ATmega 328 DIP in some cardboard and see what I can come up with. This entry was posted on November 30, 2017 by SparkFun Electronics. This entry was posted on November 30, 2017 by Rob Zwetsloot. One of the most exciting aspects of the new SparkFun Inventor’s Kit (SIK) v4.0 is that the parts and experiments were chosen to create finished, functional projects. Because of this new, project-focused spin on our popular beginner’s kit, I found that taking things further to create even more new projects was a breeze. If you’ve worked through the projects in the SIK (or if you’re hoping to get one for the holidays), I’ve put together three additional projects that you can complete (with few or no extra parts required). The phrase “Clap On! Clap Off!” might arouse fond nostalgia from TV commercials of yesteryear. If not, don’t worry! 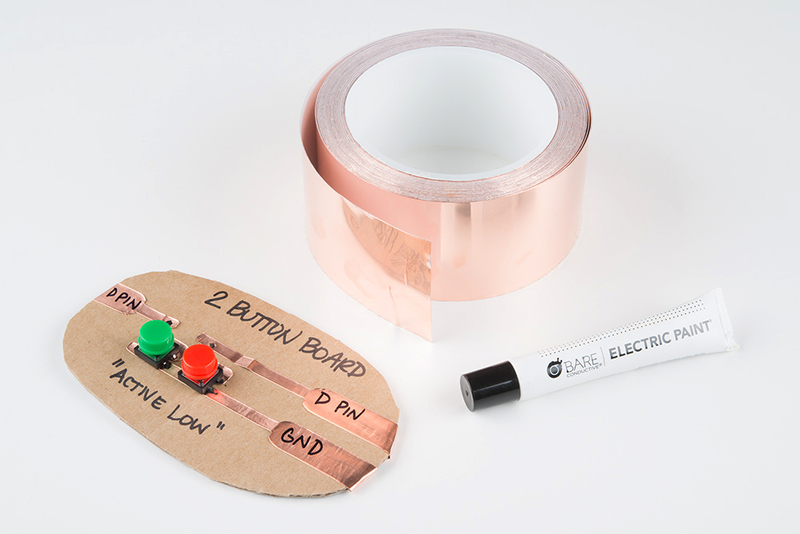 We’ll use a Sound Detector board and parts from the SIK to detect two successive, sharp noises to pull a chain on a lamp. 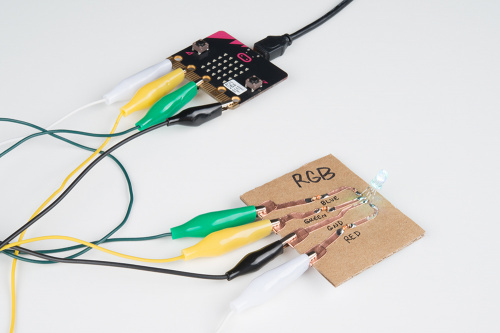 Adding a servo to a pull-chain lamp is an amusing way to create an automated lighting system. In addition to the sound detector board, you could use a light sensor to pull the chain when the ambient room lighting falls below a certain level, or you could add an ultrasonic sensor to work as a virtual trip wire so that the light turns on whenever something gets near the lamp. One of the final projects in the SIK v4.0 guide is a fully autonomous robot that detects and avoids obstacles. We can expand on the robot by replacing the ultrasonic sensor with the included photocell in order to detect areas of bright light. For educators, this might be a useful project for showing how simple organisms, like Euglena, seek out light for assisting with photosynthesis. The tutorial shows how to perform a very simple search algorithm: look left, right and center; choose the direction with the most light; and move in that direction. Computer scientists (or anyone interested in learning about artificial intelligence) could take the project even further to implement a Q-Learning algorithm with additional sensors to help the robot learn its environment. Any gamers in the audience might remember the endless running (or endless flying, I suppose) games Temple Run and Flappy Bird. 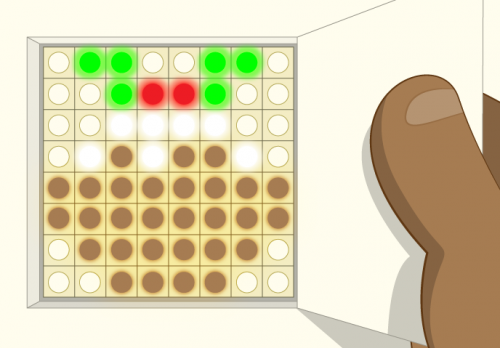 The premise is simple in these endless-style games: your character moves forward, and the player must make one or more simple choices to avoid obstacles (turn left/right, jump, etc.). Instructables user joshua.brooks created a wonderfully addicting endless runner game using an Arduino, a character LCD and a single button (the original project can be found here). We’ve updated the project to show how it can be made with parts from the SIK. These three projects should be fun additions to your SIK repertoire. What other simple Arduino projects have you seen that would be good for beginners and students? Let us know in the comments below. This entry was posted on November 29, 2017 by SparkFun Electronics. It’s never too early for Christmas-themed resources — especially when you want to make the most of them in your school or Code Club! So here’s the ever-wonderful Laura Sach with an introduction of our newest festive projects. In the immortal words of Noddy Holder: “it’s Christmaaaaaaasssss!” Well, maybe it isn’t quite Christmas yet, but since the shops have been playing Mariah Carey on a loop since the last pumpkin lantern hit the bargain bin, you’re hopefully well prepared. 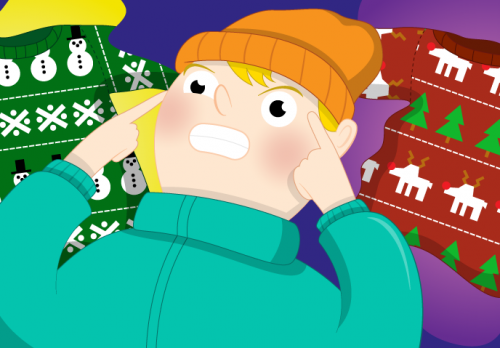 To get you in the mood with some festive fun, we’ve put together a selection of seasonal free resources for you. Each project has a difficulty level in line with our Digital Making Curriculum, so you can check which might suit you best. Why not try them out at your local Raspberry Jam, CoderDojo, or Code Club, at school, or even on a cold day at home with a big mug of hot chocolate? Jazzy jumpers (Creator level): as a child in the eighties, you’d always get an embarrassing and probably badly sized jazzy jumper at Christmas from some distant relative. Thank goodness the trend has gone hipster and dreadful jumpers are now cool! This resource shows you how to build a memory game in Scratch where you must remember the colour and picture of a jazzy jumper before recreating it. How many jumpers can you successfully recall in a row? Sense HAT advent calendar (Builder level): put the lovely lights on your Sense HAT to festive use by creating an advent calendar you can open day by day. However, there’s strictly no cheating with this calendar — we teach you how to use Python to detect the current date and prevent would-be premature peekers! 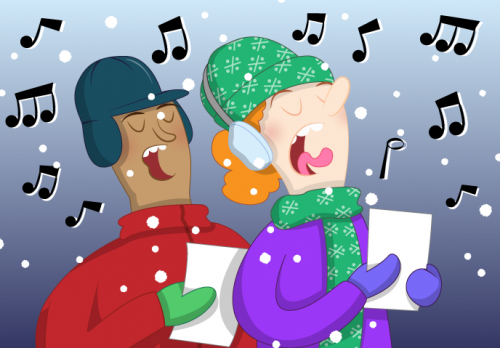 Code a carol (Developer level): Have you ever noticed how much repetition there is in carols and other songs? This resource teaches you how to break down the Twelve days of Christmas tune into its component parts and code it up in Sonic Pi the lazy way: get the computer to do all the repetition for you! No musical knowledge required — just follow our lead, and you’ll have yourself a rocking doorbell tune in no time! Naughty and nice (Maker level): Have you been naughty or nice? Find out by using sentiment analysis on your tweets to see what sort of things you’ve been talking about throughout the year. 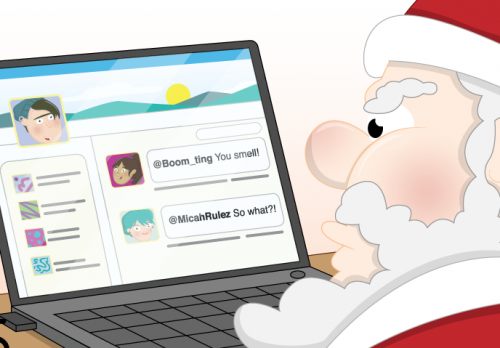 For added fun, why not use your program on the Twitter account of your sibling/spouse/arch nemesis and report their level of naughtiness to Santa with an @ mention? With the festive season just around the corner, it’s time to get started on your Christmas projects! Whether you’re planning to run your Christmas lights via a phone app, install a home assistant inside an Elf on a Shelf, or work through our Christmas resources, we would like to see what you make. So do share your festive builds with us on social media, or by posting links in the comments. 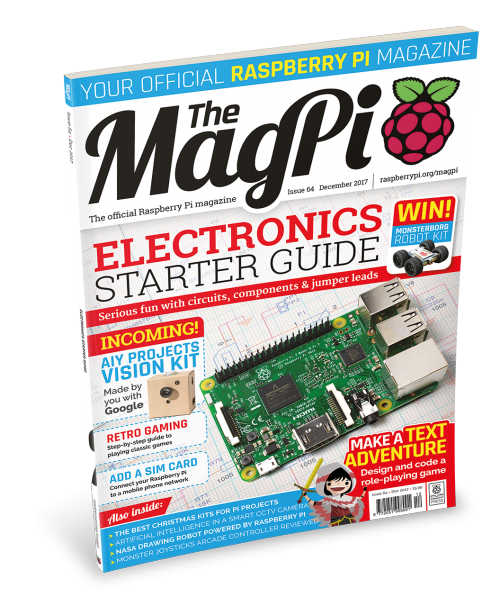 The post Our brand-new Christmas resources appeared first on Raspberry Pi. This entry was posted on November 29, 2017 by Laura Sach. 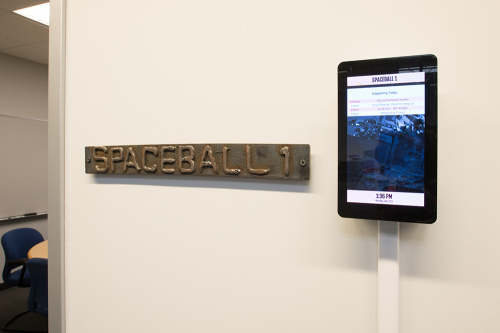 In the first installment of this two-part post, we built a conference room sign that automatically updates based on a Google Calendar resource. 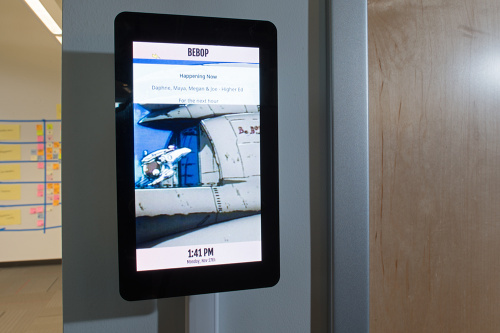 We used a Raspberry Pi and a 7-inch touchscreen as our hardware platform and wrote the software in HTML, JS and CSS, using ElectronJS to run it on a kiosk OS for single-board computers called BenjaOS. If you missed that post, you can check it out here. At the time of part one, I was still waiting on some enclosures and cable covers to arrive before I could install the first signs next to their respective meeting rooms. Well, when the enclosures finally arrived (all the way from Shenzhen) they seemed a little bulky. To be clear, I got exactly what I ordered. But when I looked at the display mounted in place the enclosure seemed excessively deep and heavy. I set about designing one in Fusion 360 to print on our TAZ 5 3D printer. I printed a pair of these enclosures on the TAZ 5 – with its new cardboard heat tent – and got very lucky on my first try! The only modifications I had to make to the printed parts for them to properly fit was to use a drill to widen the bolt holes slightly. The enclosures bolted to the LCDs using M3 hardware and provided some nice flat surface on the backside for mounting the device with double-sided foam tape. The opening in the bottom perfectly accommodates the profile of the cable management solution that I bought on Amazon, so there’s no gap where you can see the cable poking through. My next step was to grab some CAT5 and barrel jack extension cables and run my wiring for the signs. The two premier locations for this system were chosen because they’re close to my office and just around the corner from one another. There is a network drop and a power outlet located midway between them, allowing me to power both signs and give them dependable network connections. My cable management solution was a home theater cable race kit from Wiremold. It took two kits to have enough fittings and races but it installed cleanly and easily. All of the cable races are backed with foam tape - just peel and stick. After the cable races are stuck to the wall, they can be hinged open to hide your cables. 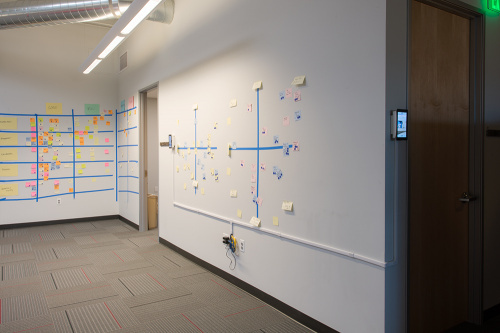 I put a T-junction over the network drop and power outlets and split off in the direction of each conference room, using my smartphone as a level (with mixed results). Then each end got a 90° elbow and another cable race up to the sign enclosures. I powered the Raspberry Pis by making an adapter out of a micro-b plug breakout and a female barrel jack adapter. The breakout plugged into the USB jack on the LCD hat, and the barrel jack adapter allowed me to use barrel jack extension cables to get a long, clean run of DC wiring to the 5VDC wall adapter. The Pi with the 7-inch LCD attached is – admittedly – unhappy about its power situation and continually shows a low power warning in the top corner of the screen, but it isn’t distracting and is unlikely to cause damage to the unit so I’m leaving it alone for now. If the wall adapter fails, I’ll replace it with something a little beefier. At 2 amps, the wall adapter is bare minimum for running both the Pi and the LCD backlight. The signs have been in regular use for about a week now and so far I’ve gotten a lot of positive feedback. I’m certainly not the first person in the building to have thought of doing this, so people are excited to see one working. No word yet on whether it’s prevented any mid-meeting surprises, but as for staying stable and accurate running continuously for days on end? High scores all around. I think the Raspberry Pi is an excellent platform for exactly this type of project. Moving forward, I’d like to add LED splash lighting to indicate the “occupied” status of the conference room (as suggested by jma89 on part one of this series) and I’d also like to add some animated splash screens that can be interrupted by touching the display. For now, though, these seem like a step in the right direction. Wanna make your own? Check out the GitHub Repo! It contains the ElectronJS app as well as STEP, IGES, Mesh and Fusion 360 files for the 3D-printed enclosure. This entry was posted on November 28, 2017 by SparkFun Electronics.